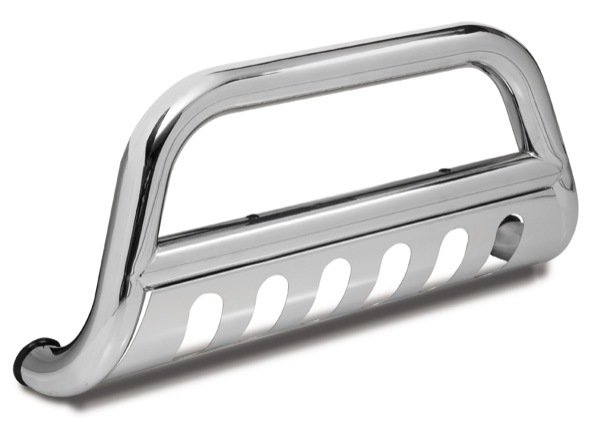 Outland® Stainless Bull Bars feature prime 304L, .05-inch wall stainless tubing polished to a mirror finish. The polishing process for an Outland® Bull Bar is the same used on their high quality tube steps pulling the true shine out of the metal. By using only prime 304L stainless, these stainless Bull Bars will never rust, providing years of use and great looks. Outland® Bull Bars feature no hassle installation. Each Bull Bar is custom fit for the specific vehicle making sure the mount points are the strongest available Tough 3/8-inch-1/4-inch powder coat painted mounting brackets and oversized hardware ensure that the Bull Bar provides years of vibration free use. Each Bull Bar includes a matching skid plate for added protection and dynamic good looks. Each skid plate is laser cut to ensure clean smooth lines and a no hassle installation.